F or a more dynamic presentation, see the Online Theological Education Zotero group. This list builds on that of Charles Bellinger, Theological Education and Distance Learning: A Working Bibliography. Amos, K. E. (1999). Report of the Survey of Ats Schools on Educational Technology and Distance Education. Theological Education, 36, 125–140. Anderson, K. M. (2007). A Case Narrative of Bethel Seminary’s InMinistry Program. Theological Education, 42(2), 67–78. Atkinson, H. (1990). Theological Education by Extension : An Alternative in Education. Christian Education Journal, 10(2), 25–37. Basney, L. (1999). The Schoolroom in the Factory : Reflections on Technology and Its Place in Seminary Education. Calvin Theological Journal, 34, 417–431. Bellinger, C. K. (2003). Distance Learning and Theological Education. American Theological Library Association Summary of Proceedings, 57(1), 150–153. Bothma, T. J. D. (1992). Hypermedia as Information Model in Studying Biblical Languages and Cultures. In Bible Et Informatique (pp. 329–350). Bouchard, C. E. (2003). Serendipity or Grace? What Evaluation Has Taught Us about Education and Ecclesiology in Distance Learning. Theological Education, 39(2), 97–106. Boyce, J. L., & Nysse, R. W. (1998). Technology and the Classroom. Word & World, 18, 418–421. Browning, M. (2004). The Hermits of Distance Education: Toward a Broader Commitment to Online Learners. Christian Scholar’s Review, 33(4), 547–556. Buchanan, E. A. (1997). Virtual Theological Education : Cybertraining for Evangelization and Discipleship. Faith and Mission, 14, 28–45. Cannell, L. (1999). A Review of Literature on Distance Education. Theological Education, 36, 1–72. Carroll, J. W. (1997). Being There : Culture and Formation in Two Theological Schools. Oxford University Press. Cormode, S. (1999). Using Computers in Theological Education: Rules of Thumb. Theological Education, 36, 101–116. Dart, J. (2013). Seminaries expand online options. The Christian Century, 130(20), 14–15. Delamarter, S., & Brunner, D. L. (2005). Theological Education and Hybrid Models of Distance Learning. Theological Education, 40(2), 145–164. Detar, M. D. (2015). Theological Librarianship from a Distance. Theological Librarianship, 8(2), 11–15. Deulen, A. A. (2013). Social constructivism and online learning environments: toward a theological model for Christian educators. Christian Education Journal, 10(1), 90–98. Dickason, J. (1997). Library Services to Real Students from Virtual and Extension Programs : Serving the Distant Learner. American Theological Library Association Summary of Proceedings, 51, 253–256. Dominguez, A. W., McMinn, M. R., & Moon, G. W. (2009). Teaching Integration Outside the Traditional Classroom. Journal of Psychology & Theology, 37(1), 48–53. Dukes, J., & Bourgond, G. W. (1999). Summaries of Two Experimental Distance Education Programs. Theological Education, 36, 117–124. Eastep, A. C. (2017). At-Home Seminary: Why More and More Students Are Leaning Toward Distance Learning. Christianity Today, 61(4), 67. Eliceiri, E. M. E. (2000). Nuts and Bolts of Distance Education. American Theological Library Association Summary of Proceedings, 54, 33–48. Estep, J. R. (2012). The profession of teaching Christian education. Christian Education Journal, 9(2), 342–344. Fletcher, S., Compton, K., & Miller, R. (2014). Toward a model for consortial sharing of e-books among theological libraries. Theological Education, 48(2), 25–32. Flynn, J. T. (2013). Digital discipleship: Christian education in a digital world. Christian Education Journal, 10(1), 88–89. Flynn, J. T. (2013). MOOCs: disruptive innovation and the future of higher education. Christian Education Journal, 10(1), 149–162. Forrest, B. K., & Lamport, M. A. (2013). Modeling spiritual formation from a distance: Paul’s formation transactions with the Roman Christians. Christian Education Journal, 10(1), 110–124. Fritschel, A. (2017). Wartburg’s Savvy Stewards Program. Currents in Theology and Mission, 44(3), 5–8. Galli, M. (2013). Higher ed at a crossroad: why the local church should care, and what it can do. Christianity Today, 57(4), 61–61. Glader, P. D. (2014). The unlikely innovator: two traditional Christian universities embraced Michael Clifford’s vision for online ed. The are now giants in the field. Christianity Today, 58(8), 60–64. Goodwin, W. (1996). Serving Remote Students in Distance-Learning Programs. American Theological Library Association Summary of Proceedings, 50, 25–58. Groeling, J., & Boyd, K. A. (2009). The Impact of Distance Education on Libraries. Theological Librarianship, 2(1), 35–44. Groeling, J., & Ruth, L. (2007). The Times, They Are A-changin’: How a Training Seminar for Online Education Changed a Seminary One Faculty Member at a Time. Theological Education, 42(2), 57–66. Haar, S. (2008). E-constructing Theological Education for Ministry in a WWW World. Lutheran Theological Journal, 42(1), 18–29. Hatcher, R. L. (2013). Professional identity development in online Christian theological education: A case study of preparing pastoral practice through discursive activity. ProQuest Dissertations Publishing. Hawkins, T. R. (2004). From the 3Rs to the 3Ws: Continuing Education in a Digital Age. Quarterly Review, 24(2), 168–180. Hogue, M. S. (2014). From resistance to resurrection: Meadville Lombard’s TouchPointSM model of theological education. Theological Education, 48(2), 33–41. Howard, C. M., & Zaragoza, E. C. (2003). “Here I Am, Lord”: First Steps into Online Learning. Journal of Theology, 107, 43–56. Hueth, A. C. (2004). E-learning and Christian Higher Education: A War of the Worlds, or Lessons in Reductionism? Christian Scholar’s Review, 33(4), 527–546. Janzen, J. (2015). Instructor empathy and student retention in online learning environments. Direction, 44(1), 128–129. Jones, B. F. (2014). Lights, camera, teach. The Christian Century, 131(13), 43–43. Karaman, S., Aydemir, M., Kuçuk, S., & Yildirim, G. (2013). Virtual classroom participants’ views for effective synchronous education process. Turkish Online Journal of Distance Education, 14(1), 290–301. Kennedy, J. W. (2010). The iSeminary Cometh: Online Education Is Jolting Seminaries with Rapid Enrollment Growth. Christianity Today, 54(4), 1. Kennel-Shank, C. (2017). Forming priests among the people. The Christian Century, 134(4), 30. Kinsler, F. R. (1999). The Viability of Theological Education by Extension Today. Ministerial Formation, 85, 5–18. Knefel, M. A., Thompson, M. L., & Helmke, J. (2010). Faculty/librarian Collaboration in Creating a Research Assignment for Distance Education Students. American Theological Library Association Summary Of Proceedings, 64, 100–103. Kuligin, V. (2007). Going the Distance: Adapting Full-time Residential Curricula into Distance Format. Evangelical Missions Quarterly, 43(3), 298–305. Lee, Y.-L. (2013). The Technologizing of Faith: An Ethnographic Study of Christian University Students Using Online Technology. Christian Education Journal, 10(1), 125–138. Lester, G. B. (2014). “Essential questions” Twitter chats. Teaching Theology & Religion, 17(3), 224–224. Lockhart, E. B. (2012). Online theological pedagogy: The influence of dialogue on spiritual formation in the online theological classroom. ProQuest Dissertations Publishing. Lowe, S. D., & Lowe, M. E. (2010). Spiritual Formation in Theological Distance Education: An Ecosystems Model. Christian Education Journal, 7(1), 85–102. Lucker, J. K. (1997). How Do Changing Needs Shape Future Library Space : Graduate Theological Education, Information Technology and Library Space Planning. American Theological Library Association Summary of Proceedings, 51, 227–229. MacDonald, G. J. (2013). Churches turn to part-time clergy. The Christian Century, 130(21), 14–15. Maddix, M. A. (2012). Generating and facilitating effective online learning through discussion. Christian Education Journal, 9(2), 372–385. Maddix, M. A. (2013a). Developing online learning communities. Christian Education Journal, 10(1), 139–148. Maddix, M. A. (2013b). E-learning in the 21st century: a selected top ten book reviews since 2001. Christian Education Journal, 10(1), 163–179. Maddix, M. A., & Estep, J. R. (2010). Spiritual Formation in Online Higher Education Communities: Nurturing Spirituality in Christian Higher Education Online Degree Programs. Christian Education Journal, 7(2), 423–434. Mainwaring, S. J. (2015). Place, Power, and People in Twenty-first Century Theological Education. Anglican Theological Review, 97(1), 91. Marangos, F. (2003). The Internet and Distance Learning: Plumbing the Well of Cyberspace for Religious Education. Greek Orthodox Theological Review, 48(1–4), 241–270. Markette, J. A. A. F. (2012). A quasi-experimental study of religiosity of undergraduate students enrolled in an online Christian worldview course. ProQuest Dissertations Publishing. Marshall, J. W., Hisrich, M., & Pinzino, J. M. (2014). A changed game, and changing the game: adapting to new realities and innovating new solutions. Theological Education, 48(2), 15–24. Martin, E. (2014). The brain game: teaching strategies for introverted vs. extroverted students. Bulletin for the Study of Religion, 43(3), 39–46. Martz, D. A. (1998). Seminary Reform : A Blueprint for Revisioning. Sewanee Theological Review, 41, 357–366. Mercer, R. L. J., & Simpson, M. (2015). What would Kant tweet? : the utilization of online technology in courses involving formation, meaning, and value. Theological Education, 49(2), 1–18. Meyer, D. A. (2014). A gospel-based budgeting of theology’s resources. Concordia Journal, 40(2), 95–98. Miller, R. (2011). Best practices in online education. American Theological Library Association Summary of Proceedings, 65, 113–121. Miller, S., & Scharen, C. (2015). Paying for seminary. The Christian Century, 132(4), 11. Mueller, A. W. (1997). Library Services to Real Students from Virtual and Extension Programs. American Theological Library Association Summary of Proceedings, 51, 257–261. Muether, J. R. (1997). Library Services to Real Students from Virtual and Extension Programs : “Keeping Faith with the Old Library.” American Theological Library Association Summary of Proceedings, 51, 263–266. Nam, R. S. (2009). Online Theological Education: Perspectives from First-generation Asian American Students. Theological Education, 45(1), 59–69. Nyitray, V. L. (2001). Distance Learning: Proceed with Caution. Council of Societies for the Study of Religion Bulletin, 30(4), 85–87. Osei-Bonsu, R., & Dei, D. (2015). Theological training for effective pastoral ministry: a collaborative approach. Trinity Journal of Church and Theology, 18(4), 103–120. Patterson, E. (1996). The Questions of Distance Education. Theological Education, 33(1), 59–74. Penner, K. (2009). Information Needs and Behaviours of Theology Students at the International Baptist Theological Seminary. Theological Librarianship, 2(2), 51–80. Peterson, A. J. (2015). Big data for faculty development in research and teaching. Theological Education, 49(2), 75–87. Pfeiffer, C. (2011). The contour methodology: teaching the Bible in the digital age. Conversations with the Biblical World, 31, 204. Pruitt, R. A. (2011). The application of cognitive-developmental or mediated cognitive learning strategies in online college coursework. Teaching Theology & Religion, 14(3), 226–246. Raybon, S. P. (2012). 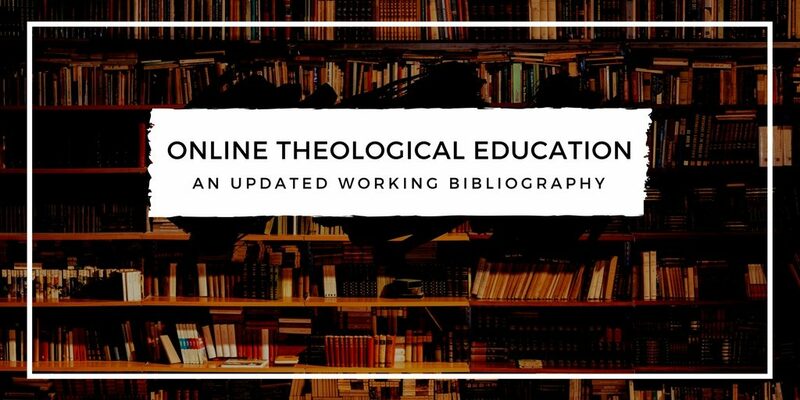 An evaluation of best practices in online continuing theological education. ProQuest Dissertations Publishing. Reissner, A. (1999). An Examination of Formational and Transformational Issues in Conducting Distance Learning. Theological Education, 36(1), 87–100. Roberts, S. K. (1999). A Survey of Accrediting Agency Standards and Guidelines for Distance Education. Theological Education, 36(1), 73–86. Rodrick-Schnaath, H., & Lose, D. J. (2017). Responding to the Economic Challenges Facing Future Ministers at the Lutheran Theological Seminary at Philadelphia. Currents in Theology and Mission, 44(3), 18–21. Roels, S. J. (2004). Global discipleship and online learning: what does blackboard have to do with Jerusalem? Christian Scholar’s Review, 33(4), 451–470. Rovai, A. P., & Baker, J. D. (2004). Sense of Community: A Comparison of Students Attending Christian and Secular Universities in Traditional and Distance Education Programs. Christian Scholar’s Review, 33(4), 471–489. Sangha, L. (2016). Old Technologies, New Approaches: How Can Material Culture Take Students Beyond the Text? The Sixteenth Century Journal, 47(4), 978–981. Satyanarayana, P., & Meduri, E. D. K. (2013). Use of distance education by christian religion to train, edify and educate adherents. Turkish Online Journal of Distance Education, 14(2), 35–43. Schachter, L. (1998). Videoconferencing and Jewish Education : Paradox and Promise. Beer-Sheva : Ben-Gurion Univ of the Negev Press. In Judaism and Education (pp. 377–392). Beer-Sheva: Ben-Gurion University of the Negev Press. Selwyn, J. D. (2015). Adventures in experiential education: online teaching and learning. The Sixteenth Century Journal, 46(4), 1019–1022. Semenye, L. (2013). Trends in Christian education in East Africa. Christian Education Journal, 10(2), S73–S79. Shore, M. H. (2007). Establishing Social Presence in Online Courses: Why and How. Theological Education, 42(2), 91–100. Smith, L. C. (1999). The Academic Library’s Role in Distance Education. American Theological Library Association Summary of Proceedings, 53, 125–132. Spencer, J. (2012). An 8-week online capstone experience. Teaching Theology & Religion, 15(2), 184–185. Spencer, J. (2015). Online education and curricular design. Theological Education, 49(2), 19–31. Steffan, M. (2012). Discipling the masses: Christian colleges try massive online courses. Christianity Today, 56(9), 15–16. Tait, J. W., Berryhill, C., Badke, W., Endicott, J., & Hicks, J. M. (2010). Pray, Work, Study, Log On: Can Libraries Be a Common Ground in Online Theological Education? American Theological Library Association Summary Of Proceedings, 64(1), 54–61. Thompson, M., & MacLeod, M. (2015). To the ends of the earth: cultural considerations for global online theological education. Theological Education, 49(2), 113–125. Thorne, J. A. (James A. (2013). Biblical online education: contributions from constructivism. Christian Education Journal, 10(1), 99–109. Tonkin, S. E. (2004). The Christian Ethos and E-learning. Christian Scholar’s Review, 33(4), 557–568. Torma, R. (2012). Mobile learning for congregations. Word & World, 32(3), 267–276. Veldheer, K. J. (2011). Reference without borders: best practices for providing reference to distance students. American Theological Library Association Summary of Proceedings, 65, 220–222. Walker, K. (1996). Virtual Education: Cyber Seminaries Are Wiring for Long-Distance Learning. Christianity Today, 5, 110–111. White, R. (2006). Promoting Spiritual Formation in Distance Education. Christian Education Journal, 3(2), 303–315. Wiens, T. L. (2014). Educating clergy online: A pedagogical map to guide and assess spiritual integration. ProQuest Dissertations Publishing. Williams, R. B. (2001). Getting Technical: Information Technology in Seminaries. Christian Century, 7, 14–17. Womack, A. (1996). Technology in the Classroom: Multimedia and Theological Education. American Theological Library Association Summary of Proceedings, 50, 243–263. Wood, L. (2013). Face-to-screen learning: seminaries go online. The Christian Century, 130(4), 28.